This entry was posted in 18c, 19c, genre comparison, methodology by tedunderwood. Bookmark the permalink. This is a very interesting start, especially when you ‘project’ this onto a population as an index of their way of thinking about and being in the world. I’ll be interested to see how things develop. And, yes, this is more than a one-person job. With any luck it’s an opening that will yield more openings. Great stuff. I have to read this more carefully. For me, the single strongest point is the increasing similarity between fiction and poetry over the period–that’s really interesting, and answers a number of the initial questions. 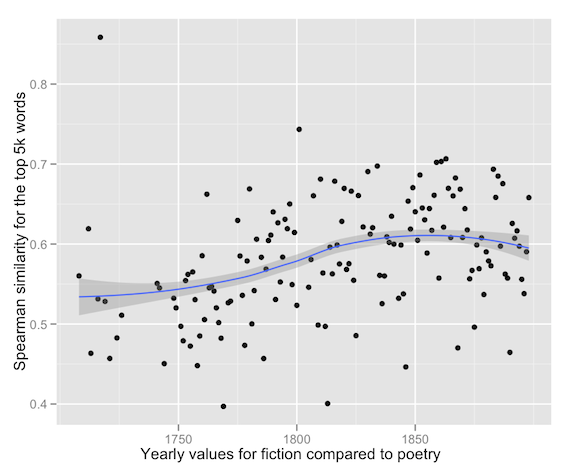 On the other hand, I have a hard time accepting the conclusion that poetry in 1850 is closer to nonfiction in 1720 than nonfiction in 1850 is–could you gloss that, maybe, if the chart is correct? Responsiveness to corpus size, if I’m understanding you right, is a little troubling, because it makes almost all the numbers extremely difficult to compare. (E.g. 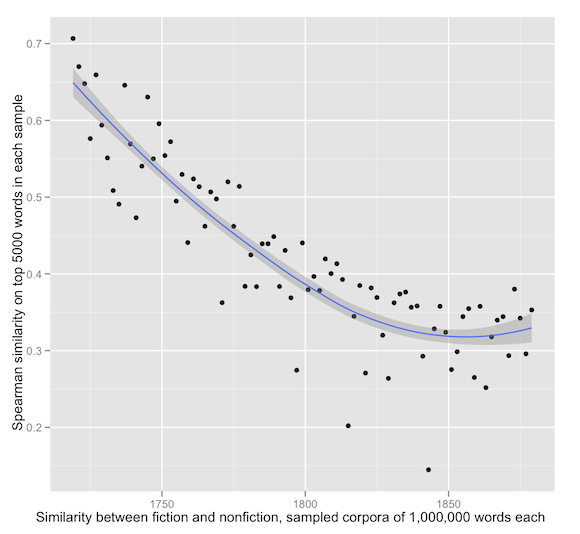 : Is poetry really farther from nonfiction than fiction is, or is it just a much smaller corpus?). Have you thought about running the comparisons multiple times on corpuses of constant size? And is there anyway to overweight more frequent words? The difference between the 200th most common word and the 100th is a lot more important than the difference between the 4500th and the 3500th. Scrap the last sentence of the first paragraph, I see I was misreading the caption. There are lots of ways to overweight more frequent words, and candidly, taken far enough, they do tend to destroy the pattern I’m observing. But I’m tentatively persuaded by Adam Kilgarriff’s arguments about corpus comparison — in the reference I cite above. Basically he suggests that there is no one “right” way to compare corpora. The question of whether you care more about frequent words than you do about less frequent words is going to depend on the conclusion you want to draw. I’m tacitly proposing a distinction between stylometry (which definitely does care more about common words) and comparison of diction (where it’s not clear to me that the same weighting rules need to apply). I admit that there has to be some limit, though, in practice: I don’t think you would want to run comparisons on the whole lexicon. The advantage of Spearman’s is that (compared to most other measures of similarity) it’s *pretty* independent of corpus size. But you’re right. Before I can make really firm claims I probably have to run these tests with constant corpus sizes. I re-ran with constant corpus sizes. Much better results! See update above. Thanks. Awesome, glad it works! Splitting up each component into multiple million word chunks and averaging would probably get even cleaner results, but that doesn’t seem to be necessary. Stylometry vs. diction is an interesting distinction; I almost wonder if for humanistic purposes we could argue for just retiring stylometry entirely. The old writing on stylometry is insistent that common words are the best indicators of authorship, but of course Mosteller and Wallace couldn’t look at data with high dimensionality. My recent bigram obsession has me wondering if we can’t often just think of function words as rough indicators of bigrams, which are lower frequency. I might try to run some of this on some Bookworm genres if I get some time. 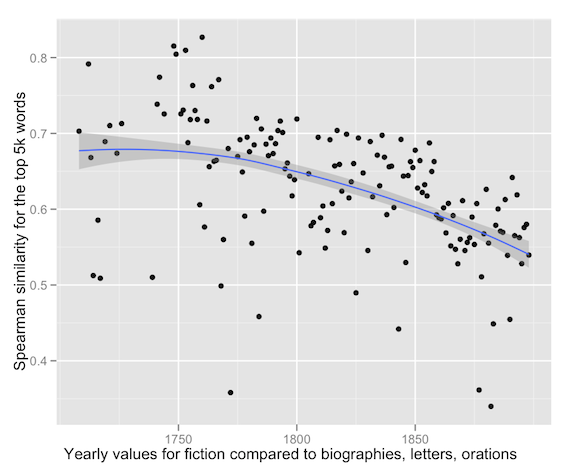 The levelling off of distance between fiction and nonfiction after 1850s in the latest graph has me intrigued. Interesting point. I don’t know the history of stylometry well enough to know how much has changed. But I have recently begun to notice empirical results that conflict with things I’ve read. For instance, just as a classroom exercise in a class I’m teaching here, we clustered novels using cosine similarity of the top 1000 words — and it produced very tight authorial groupings. That did make me start to wonder whether the stories about needing to select a short list of common words were really true. 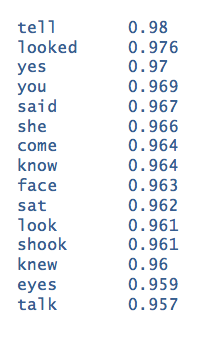 Of course the cosine similarity measure does tend to overweight common words in practice, but it doesn’t require that you construct a selected list of function words or anything like that. A thought-provoking post, Ted! 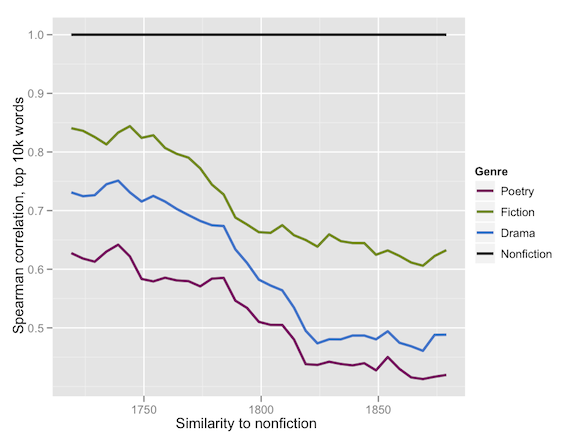 I wonder, as you briefly suggest, if you’re seeing not the emergence of a “literary diction,” but instead the emergence of “non-literary diction” in genres outside of poetry, fiction, and drama. I work with early C19 newspapers, for instance, in which news, poetry, fiction, and other genres all intersect and collide. When I read these newspapers with students, they will often comment at how “story-like” even news reports are. That is, the diction of early news often “sounds” very similar to the diction of short stories. As journalism professionalizes through the nineteenth century, however, the gap between literary prose and journalistic prose widens–and the inclusion of poetry and fiction within newspapers dwindles. I’m sure that’s a big part of it. We don’t have periodicals in this dataset, but if you look back at early 18c nonfiction books, they’re often extremely colloquial and vivid. By the late 18c prose diction is already becoming more abstract. I’ll have more to say about that in a couple of weeks. But I would frame this as both/and; I think there’s an “official public language” emerging at the same time as a “literary language.” I suspect they both specialize to fill a niche. We tweeted briefly about this, but just to register the gender issue of the corpus — those volumes available over ECCO are perhaps more complete than those over Worldcat or any other 19th C representation. One of the biggest issues in 19thC digital work is that we have focused primarily on canonical authors rather than forming a complete view of the publishing world. You mentioned that the 19thC corpus skewed male. I’m concerned about this — that it perpetuates the 19thC digital work and essentially will further marginalize those, well, marginal authors (women, working class, etc.). I’d be interested to see the titles culled for the 19thC texts. But, that’s my nit-picky gender and book history perspective. This is a massive and wonderful start to this project. Rock on! Thanks for telling them about it! Very interesting analysis. I am interested how historians use visualizations to communicate arguments, so I hope you will bear with me if I probe your strategy of presentation a bit. 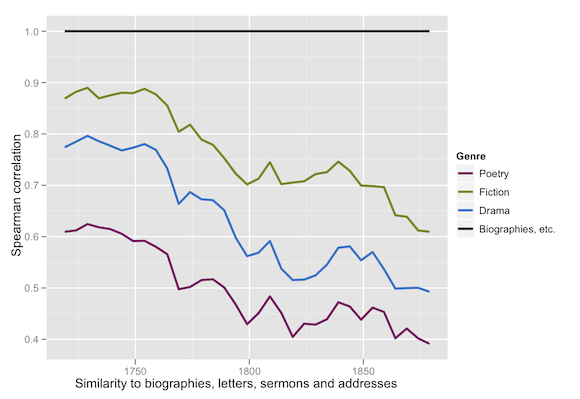 The story I get from eyeballing the first three graphs is that the increasing dissimilarity of fiction genres from non-fiction begins ca 1740 and continues at a fairly constant rate until ca 1800. At that point, fiction becomes dissimilar at a much slower rate, while poetry and drama continue to diverge from non-fiction at the same rate until ca 1820, when they too begin to level off. (when the comparison is limited to biographies, the trend lines are similar, except that the rate of divergence begins to grow again ca. 1850). 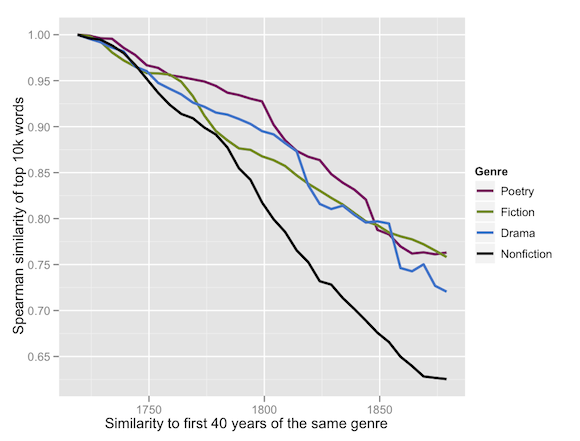 Meanwhile, the vocabularies of all four genres are changing fairly linearly over the course of the century, with fiction, drama, and poetry all showing similar slopes and non-fiction changing more dramatically. Yes, that’s a very good idea, and I did run a comparison like that with fiction as the baseline. (I ran a whole lot of things not included here for reasons of space.) The lines do follow a different pattern — basically poetry and drama bob and weave a bit inconclusively, while nonfiction diverges dramatically. But I need to rerun that comparison — and a lot of these comparisons — with a fixed corpus size. I’ll probably produce a follow-up post that addresses some of the suggestions I’ve received in the comments. So many things this post has had me thinking about, despite needing to teach and go to meetings and all the usual weekday stuff. In your remarks about the updated results you say “since document size varies across time, it’s better to select corpora that have a fixed number of documents rather than a fixed word size” — one of the things that struck me in looking at the data you provided was about the possible impact of changing publishing conventions in the 19thc, and how analyses like this might begin to address those changes. Like Ryan, I was thinking about periodical publishing, but also about book formats. This is about defining corpora — it looks like in the data file that three-volume novels (and other genres in multi-volumes) are treated as three separate documents. Which I understand makes sense for all kinds of reasons. But if you run results with fixed number of documents, does that account for over-representation of certain authors (and hence their diction) who published in 3 vol format vs those that didn’t? Thanks for commenting — I’m really enjoying the discussion. In the updated results I ran the comparison on corpora with a fixed number of *words*, and actually I think the rationale for holding #-of-words constant is much stronger than the rationale for holding #-of-documents constant. (For basically the reason you point out.) I just wanted to acknowledge that you see broadly the same pattern if you *do* hold #-of-documents constant. Response up on my blog. Fabulous site! Prof. Underwood, I’m interested in narrativity or storyness and how it changed throughout the centuries. It seems to me there are a lot of info and insights helpful for narratologists. Its sheer size is stunning… I wonder if you’re planning to have any book size publication for this. THanks. Thanks! A short answer is “yes”! I do think this is a big topic where there’s a lot more work to be done, and I am planning a book-size publication, though it’ll probably take a couple more years to put together.